I’ve always been intrigued by human history and wondering what it was like for people living at different times and in different places. My husband and I were lucky enough to spend a month with our friend Jocelyn Siler, who loves Scotland and its history and took us around the country to visit key locations linked to this country’s colorful history. “Every trip should be more than just a journey, it should be a quest. When you have a goal of discovery, whether it’s to find museums with paintings by Van Gogh or to enjoy the best beer halls, a quest will enrich your travels. Castles became our quest when my husband, Greg, and I visited Scotland in April. Before we had even conquered jet lag, we’d become addicted. Castles in Scotland come in all sizes, types and states of repair, from fallen-down fortresses to intact family homes that offer bed and breakfast accommodations. We managed to visit some of each kind. In the process, we encountered a delightful assortment of Scotland’s varied landscapes, interesting towns, and delightful eateries as well. Our adventures began when our friend, Jocelyn Siler, invited us to stay with her in Dundee, where she was teaching for a year under a university exchange program. Jocelyn is writing a historical novel about Mary, Queen of Scots, so many castles we visited had a strong Mary connection. Our first castle adventure began as a gentle boat ride from the shore of Loch Leven ( a ‘loch’ is either a lake or an inlet of the ocean), the largest lake in lowland Scotland, to the island ruins of Lochleven castle, where Mary was detained for almost a year in 1567. 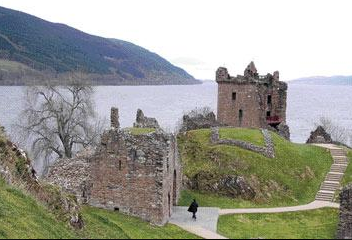 This castle is preserved by Historic Scotland, a government preservation organization. After docking, we strolled across a bright green lawn decorated by large shade trees to the small office, where we paid our fees to join Historic Scotland’s Explorer Pass program. Visitors can pay one fee that allows them to visit as many of Historic Scotland’s properties as they can over a limited time period. It’s a real bargain for history buffs. As we paid, the guide pointed out that in 1830, the water level in Loch Leven was lowered, quadrupling the area of the island. At the time of Mary’s incarceration, the island was so small that the castle pretty much covered it. I tried to imagine what it would have been like to be Mary, pregnant with twins, forced to abdicate to her infant son James, living in this cramped, dark fortress for months on end. Whether through stress or medical misfortune, she lost the twins but managed to escape in May 1568. The jaunt to Loch Leven whetted our appetites both for castles and for Mary. Our next castle adventure, however, didn’t involve her. 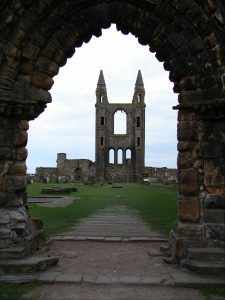 We headed for St. Andrews, an historic Scottish town famous for its great golf courses. We wandered the paths across the dunes on which the old course was built, then visited St. Andrews Castle. This imposing fortress on the shore of the North Sea – for reasons of defense, almost every major Scottish castle is breathtakingly sited – once served as the headquarters of the Scottish Church making it a vital participant in Scottish history. Today, it stands as a sad ruin, neglected for hundreds of years. Many historic castles suffered severely from quarrying – the removal of their walls as building materials for newer structures. The castle still shows some special features, the most memorable of which is the infamous bottle dungeon, the entrance of which is a hole in the floor just big enough to drop a helpess prisoner into. Those who were tossed into the bottle dungeon never got out. On to Edinburgh, whose castle site on the highest point of a dramatic volcanic ridge is so defensible that it has been occupied for almost 3,000 years. The castle itself began to serve as a fortress for royalty during the 1100s. As an American, used to anything older than 100 years of age seeming ‘old,’ I’m always amazed when I visit historic places in Europe or Asia, where a mere 100 years is like yesterday. We approached the castle from the “new town” of Edinburgh, which is only a few hundred years old. The old town towers beyond over a lovely park, with paths, museums and a concert venue. In the old days, when defense was crucial, that park had been a lake. 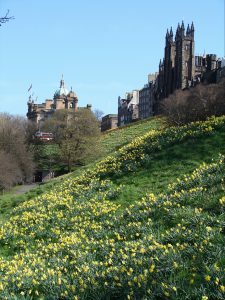 April in Scotland is daffodil time, and the entire slope leading up to the old town and the castle was festooned with bright yellow blossoms swaying in the breeze. Still a bit jet-lagged, we climbed the long staircase with effort, which was definitely worth the reward. Unlike St. Andrews castle, Edinburgh Castle has survived so well that parts of it are still used by the military. This means visitors only get to experience certain parts of the structure, such as tiny St. Margaret’s Chapel, Edinburgh’s oldest intact building, constructed about 1130. The Great Hall, dating from around 1500, gives a sense of the grandeur of times past, when royal ceremonies were held there and the Scottish Parliament once met. Scotland’s crown jewels, the oldest in Europe, are also on view. Edinburgh Castle has more to offer than we had time to explore. But of course we had to visit the Royal Apartments, where Mary, Queen of Scots gave birth to the James, future King of Scotland and England. By now, we’d gotten into a relaxing routine of waking naturally and heading to the kitchen for coffee while checking our email each morning. With Jocelyn’s wireless network, all three of us could sit at our computers, sipping our coffee and exchanging interesting tidbits from our mail and the internet. We felt as if we were inaugurating a new form of socializing. After breakfast, we’d head out for our excursion of the day, usually a destination no more than an hour or so away. Dundee is perfectly located as tourist central for western Scotland, where so much of this ancient land’s history played out. So, even though the next day was Easter Sunday, we followed our usual routine and drove to Stirling Castle, where Mary had been crowned Queen of Scotland at the age of 9 months in 1543. “Whoever controls Stirling Castle controls Scotland” goes the saying, and upon seeing the castle perched high on an isolated crag in the middle of the easiest route from west to east in the country, we could see why. The top of the crag is just big enough for the castle, so parking is tricky; we had to wait in line as one by one, other visitors departed. The day was gray and raw, more like a typical Scottish springtime than the often warm, sunny days we’d been lucky enough to experience so far. Still, Stirling Castle had a warmth to it that appealed to me. Smaller than Edinburgh Castle, its inner courtyard was big enough to give a sense of openness, yet small enough to feel homey. Many Europeans get a week’s vacation at Easter, so the chatter of children and their families from many countries filled the air. The experts have been working hard for more than 35 years to restore Stirling, studying artifacts and records to recreate the place as it once was, in its full beauty and glory, and they still haven’t finished the job. A major project is to recreate the famous tapestries that once graced the walls of the castle, “The Hunt of the Unicorn” series, four scenes woven between 1495 and 1505. The originals are on display at the Cloisters in New York, part of the Metropolitan Museum of Art. When we visited, the first two copied tapestries already hung on the walls, while the third is due to be completed this summer. The last one will be finished by June, 2008, when all four will then be displayed at Stirling Castle much as the originals were during the reign of King James V.
During King James’ time, the royal collection contained more than a hundred tapestries. I used to wonder about such huge works of art – how and where were they displayed? But after visiting cold, dark castles, I now understand what an important role tapestries played in holding in heat from the giant castle fireplaces and covering the monotonous, dark stone walls with bright and beautiful images. After shivering in the windy Stirling courtyard, we needed lunch. Just below the castle is the 220-year-old Portcullis Hotel, which has a cozy bar and restaurant. The hostess told us we were too late for lunch, that only snacks were being served. However, it turns out that in Scotland, snacks include tasty sandwiches with generous filling. Here we discovered Shrimp Marie Rose, cocktail shrimp in a tasty tomato mayonnaise, a combination we encountered throughout the rest of our explorations. We got plenty to eat in an international environment, with a German family at one table and an Arab group occupying two tables, one for the three men, the other for their wives and children. Fourteenth-century Doune Castle lies near Stirling. By this time, our Historic Scotland Passport had been stamped many times. The folks who work at the castles are especially proud of their castles and their jobs, and the attendant at Doune Castle looked at the stamps on our passport with great approval. “You’ve chosen the best,” he said, clearly meaning to include Doune in that category. Mary, Queen of Scots stayed in this well-preserved family castle and royal hunting lodge located strategically between the Lowlands and the Highlands, and it was featured in the film “Monte Python and the Holy Grail.” Doune looms dark and brooding above the landscape, with great views from the parapets of the surrounding woods and meadows. By now, we’d visited most of the nearby sights, so time had come to travel. We headed north into the southern Highlands, driving to the town of Inverness at the mouth of Loch Ness, then along the northern shore of the loch to famous Urquhart (pronounced “erkit”) Castle. As we drove, we couldn’t help but focus on the surface of the loch – maybe we’d be lucky and Nessie would rear her head above the waves. No Nessie, but we could see how the imagination could conjure up her jagged back from the rippling waves on the surface. Urquhart Castle, the guardian of the Highlands, was besieged and plundered over and over again throughout Scottish history. The final insult was to be blown up in 1692. 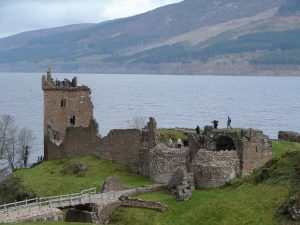 But the ruins are great fun to explore, and we climbed the circular tower staircase and look out over the loch, just in case Nessie decided to show up. Thoroughly chilled by our windy castle explorations, we settled in at a cozy B&B in the town of Drumnadrochit, where almost every home has rooms to rent. I love the quaint names of Scottish towns – Wormit, near Dundee; Tomphubil in Kinross – they’re everywhere. The next day we continued through the Highlands and took a two-day break from castles while we explored the islands of Skye and Mull. After returning to the mainland on a ferry from Mull to Oban, we drove a few miles north to Dunstaffnage Castle. By this time, we were running out of time on our Historic Scotland pass and couldn’t help wanting to maximize our stamps. Dunstaffnage Castle perches above the sheer sides of a giant rock, as if it grew directly from the stone. It is located at the intersection of important sea lanes along the west coast and has been a defended spot for at east 1,500 years. People who built castles had to find enough stones for the structures, and the walls of this castle clearly show that any stone was fair game – chunks of petrified wood, flat stones carved by Scotland’s early inhabitants, the Picts and everything else within reach. After returning to Dundee, we visited private Glamis (pronounced “gloms”) Castle, which looks on the outside just like a fairy castle from a Disney movie. For a rather hefty fee, you can wander the beautiful grounds, where Highland Cattle graze, and go inside to see various rooms restored to their appearance during different historical eras. It’s worth the price, for we got some sense of what life was like at different times in Scottish history. As our time drew to an end, we decided on a special treat to celebrate my birthday and Greg’s, which are a few days apart. We made reservations to stay at Traquair House, a small family castle and the oldest continuously occupied home in Scotland, with a royal charter signed there in 1107. Traquair has quite a history, owned by members of Mary, Queen of Scots royal Stuart family. Mary visited here with her second husband, Darnley, and their young son, James. Traquair is open to visitors every day, who can tour the house and 100 acres of grounds for a fee. There are three rooms for bed and breakfast guests. The two which we occupied are in a wing that is “only” a few hundred years old. We also had use of a drawing room, furnished in beautiful 17th to 19th century furniture. In the evening, we sat there and chatted about our day, sipping Scottish whisky (in Scotland, it’s just called “whisky,” not “Scotch”), while the fire crackled gently in the background. The next morning, after an enormous Scottish breakfast, we were able to tour the house on our own, before the tourists arrived. Even today, the Stuart family is loyal both to the Catholic faith and to their royal lineage. At the top of a hill directly in front of the castle stands the bear gate, a heavy wrought iron structure guarded by iron bears that will remain locked until a Stuart once again sits on the throne of Britain. One last castle visit was necessary, a long drive on a narrow road through pasturage inhabited only by sheep, to Hermitage Castle. This remote fortress helped bring about Mary’s downfall. While married to Darnley, she had met the Earl of Bothwell and developed some affection for him. While performing duties in the town of Jedburgh, Mary learned that Bothwell had been injured in a border raid. She abandoned her work, insisting on riding 20 miles on horseback across the barren landscape to see Bothwell. The journey seemed long today by car – I couldn’t imagine riding horseback all that way, spending a few hours, then riding all the way back to Jedburgh. Mary must have been driven by very strong feelings. The visit arose suspicions, especially since soon thereafter Mary’s husband Darnley was killed. Mary was then “kidnapped” by Bothwell and “forced” to marry him as a result. Many people believed Bothwell to be responsible for Darnley’s death and were convinced that Mary played a role in the plot. Her popularity plummeted, setting the stage for her incarceration in Lochleven Castle, her abdication of the throne, and her eventual execution. Our journey had come full circle. We had followed Mary’s royal career through Scotland’s castles, not in chronological order, but that was a small matter. Thanks to Jocelyn and Scottish Heritage, we’d developed a sense of the life of that remarkable woman, whom many felt should have sat on the thrones of both Scotland and England, and we’d enjoyed every moment of the journey. The best time to visit Scotland is between April and October because many sites are closed during late fall and winter. The Historic Scotland Explorer Pass is a great way to see the sites in Scotland and save money. Seventy-five of Scotland’s top historic properties are included, such as Edinburgh, Stirling and Urquhart castles, as well as some abbeys, museums, gardens and other attractions. You can buy a pass that allows you to visit an unlimited number of sites in three out of five days, seven out of 14 days or 10 out of 30 days. In a small country such as Scotland, it’s easy to visit several in one day. You can even purchase a pass online ahead of time at www.historic-scotland.gov.uk/explorer/, or wait until your first visit at a site.